Why would anyone have a love affair with a sporting goods store? It's simple. Let's say you just moved to NYC to go to college and it's 1969. And let's say you never left home before in your life - everything is new, exciting and scary all at the same time. Winter is coming and you need a warm coat. You have virtually no money but fortunately your mother gave you money to buy one. Where do you go and what do you buy? Those who know things say go to Tents and Trails or Paragon. There's a wave of comfort that comes over you when you enter a place like this - a feeling of confidence that you need look no further. After all, this is the leading sporting goods store in NYC - the preeminent city in the country. This is a no-nonsense new york place. All the quality brands with a experienced sales staff that can be brutally honest. 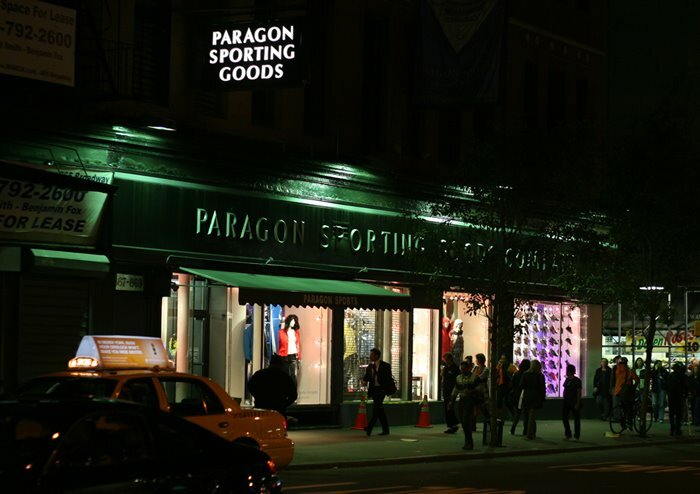 Paragon Sports, 867 Broadway at 18th Street, has been in business since 1908 - many consider it to be the finest worldwide. It has an enormous product line (50,000 products), cutting edge equipment and clothing - many products are unique, carried exclusively at this store. It has only one location, much like a handful of other unique, iconic, legendary NYC stores like B&H Photo and J&R Music World. There's an intensity about these stalwart, single location shops - no dilution of expertise or product. Everyone and everything is under one roof. Suggestion: If you visit, make sure to see all three floors and all the rooms on the ground floor. While in the area, visit ABC Carpet and Home and nearby Union Square - see here. If you work up a hunger, grab a meal Republic - see my posting here.